Perfect to give as a present or if you just can’t make up your mind which chocolate bar you prefer, the Wonders of the World Chocolate Tasting box is ideal for you. Each box contains the following delicious 50g bars. Las Trincheras 72% – Dark chocolate with smooth nutty notes. Peruvian Chulucanas 70% – Dark Chocolate with notes of raisins and plums. Venezuelan Rio Caribe 72% – Dark chocolate with comples nut and coffee notes. Madagascan Sambirano 71% – Dark chocolate hints of summer fruits. Indonesian Javan Dark Breaking 69% – Dark chocolate with rich caramel and toffee notes. Las Trincheras 72%: Cocoa mass, raw cane sugar, cocoa butter. Venezuelan Rio Caribe 72%: Cocoa mass, raw cane sugar, cocoa butter. Madagascan Sambirano 71%: Cocoa mass, raw cane sugar, cocoa butter. Indonesian Javan Dark Breaking 69%: Cocoa mass, raw cane sugar, cocoa butter. Peruvian Chulucanas 70%: Cocoa mass, raw cane sugar, cocoa butter. 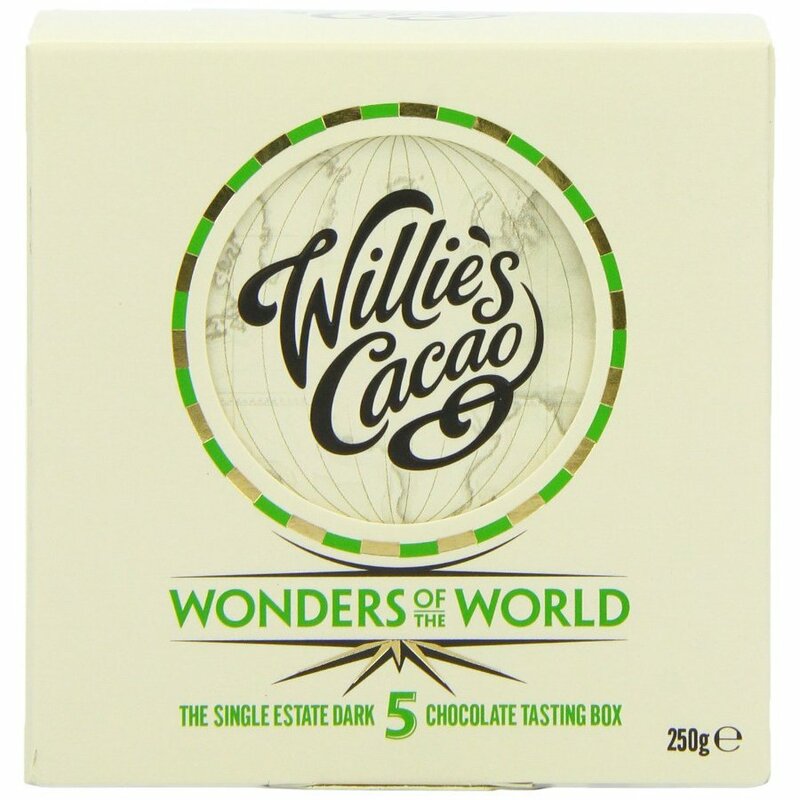 The Willies Cacao 5 Wonders of the World Chocolate Tasting Box - 5 x 50g product ethics are indicated below. To learn more about these product ethics and to see related products, follow the links below. 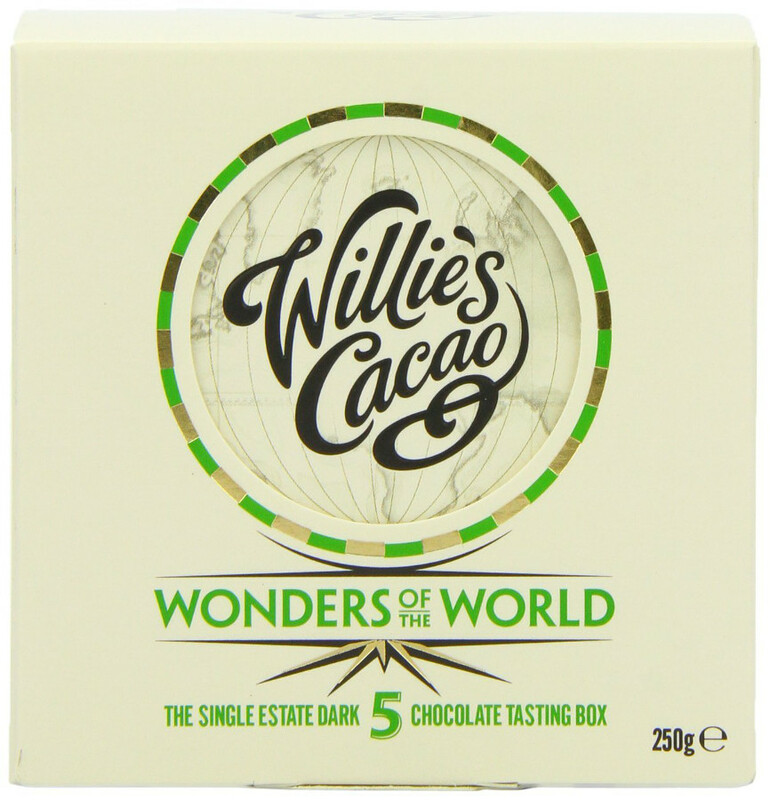 There are currently no questions to display about Willies Cacao 5 Wonders of the World Chocolate Tasting Box - 5 x 50g. Willie Harcourt-Couze ('the chocolate man') and his wife Tania sold everything they owned 12 years ago to buy a cacao farm in the Cloud Mountains of Venezuela. There he learnt to be a cacao farmer and then built a small chocolate factory in picturesque Devon to make his 100% Supreme Cacao and delicious eating chocolate. No chemicals are ever used on their cacao trees, which are irrigated by water that runs down from the cloud forest-topped mountains. Dubbed an eccentric entrepreneur, Willies Cacao is on a mission to educate the public in the delights of top quality chocolate.